You are here: HomenextTransportnextTransport - shipsnextMARGAY leaving Tilbury. The vessel MARGAY leaving Tilbury Docks. I took this photo in about 1960 (hence the quality). 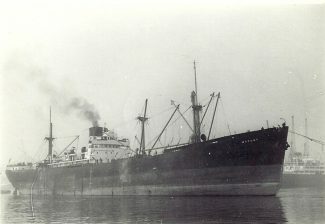 She was owned by Kaye Son and Co and built in 1946. I was with you on the day that you took this photo, and I took one similar. Mine was on an Ilford Sportsman camera, which lasted me for a few years. As for the cargo steamer MARGAY (4972 tons gross), which was built at Sunderland in 1946, she was an occasional visitor to Tilbury Dock, and was usually on charter to one of the West African lines. When she left the dock on this occasion in 1961, she went to Bevan’s Wharf, Northfleet, to load a part cargo of cement for West Africa. Within a couple of years the ship had been sold, and four owners and four names later, she sank under the name VELTA in the North Atlantic in February 1971, when carrying a cargo of manganese ore destined for Spain.